My parents have a Meyer lemon tree in their yard that produces the most fragrant citrus I've come across. This recipe for candied citrus peels is perfect for the holidays and or anytime you have peels that you just can't let go to waste. We had an assortment of pomelo, lemons and oranges which made for fun flavors and pretty colors. The key is to remove the piths from the peels, scraping them off with a paring knife and precooking the peel before candying to remove any bitterness. After simmering them in simple syrup for an hour, you're left with colorful, translucent glass-like pieces of peel. 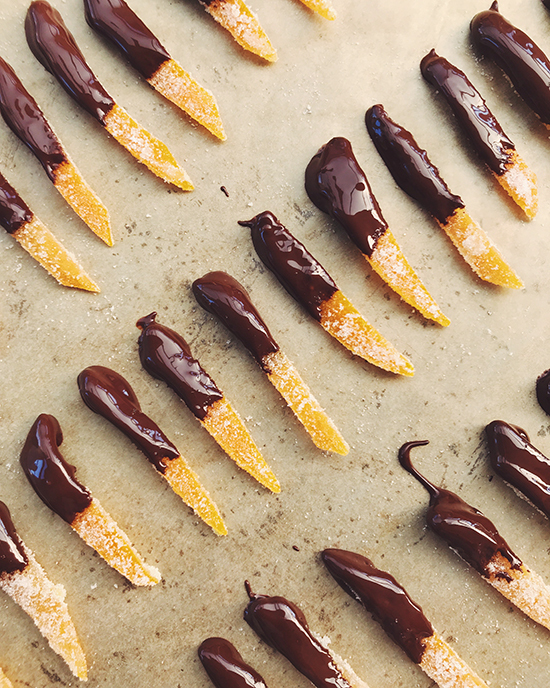 Tossing them in sugar gives them a frosty finish and if you have chocolate at home, try dipping them to make classic Orangettes. In my dream world, the lemon peels would taste like sour patch gummies, but our lemons were on the mellow side. These are so much better than the store-bought variety and can be topped on cakes or enjoyed on their own.